between the lions, originally uploaded by jahansell. Last night we got to hobnob with the fancy folk at a Bard Music Festival preview at Wethersfield Estate and Gardens in Amenia. I'd been there before but only in a rainstorm so I hadn't seen most of it - I'm not sure I've ever seen anything quite like it in person before. It's very formal, with boxwood mazes (15 feet high! ), allees, unbelievably perfect and lush flower beds, peacocks wandering freely, and expansive views of rolling hills and fields. It's open to the public so if you enjoy wandering around such places, this one is only minutes from Sharon. "A country gentleman's estate consisting of over 1,400 acres, with more than 10 acres devoted to formal gardens. 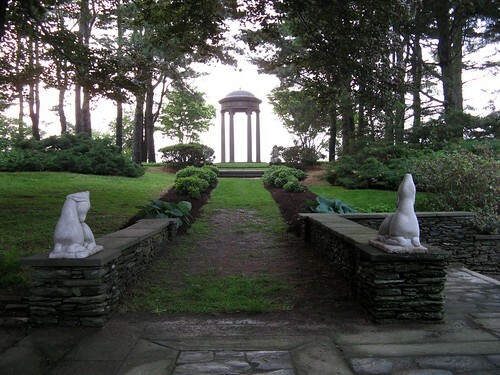 Enjoy the Cutting Garden, the Arborvitae Allee with the Naiad Fountain, the Peacock Walk, the Belvedere, the Rose Garden, and several water gardens." There is a museum there too - the New York Times mentions its " colorful array of 30 European and American carriages: from turn-of-the-century hansom cabs to phaetons raced by Chauncey Stillman, the conservationist, philanthropist and National City Bank (now Citibank) heir who bought Wethersfield, his 1,400-acre estate, in 1937 and turned his attention from hunting foxes to driving carriages." I'll post a few more photos shortly and link to them here.